Born in Buenos Aires, Argentina, Marcelo Roascio begun playing spanish guitar at the age of five. For his 17th birdthday he received his first electric guitar, and except for a few lessons with some blues and jazz teachers, he is basically self taught. During his career as a guitar player, Roascio played and recorded with several bands, including Dr.Rock, RCM, Engranaje, Los Arcontes, etc. He also worked as a studio musician doing recordings for comercials and solo artists. In 1993 he joined Steve Lynch, “Autograph's” guitar player, in his argentine band for some dates. During 1999, he played in “Noches de Guitarras Eléctricas” with Edelmiro Molinari (Almendra, Color Humano), Eduardo Rogatti (Baglietto, León Gieco) and Rodolfo García (Almendra, Aquelarre). In 2001 he played with DigiTech's guitarist/clinician Marc “Coop” Cooper and with texan bluesman Tony Sarno. In 2007, and again in 2008, he joined Carina Alfie, Diego Mizrahi and Daniel Telis to do a G3 like show called “Guitar Show Argentina” in the ND Ateneo Theater. The same year, he was asked to be part of Stuart Hamm’s (Vai, Satriani, Gambale, etc.) argentine band for his Hartke Clinic Tour. In 2010, he played with Carina Alfie, Vernon Neilly (USA) and Bill Hudson (USA) at the “Guitarras on tne Rocks” show in the Santa Maria Theater of Buenos Aires. The same year, he co-produced for Warner Chapell and Gallien Krueger’s local distributor, the CD “El Poder del Bajo”. In January 2012, Marcelo Roascio was invited by "Fernandes Guitars" to play at their booth during the NAMM 2012 show in Anaheim, California. While in USA, he also did a clinic with Vernon Neilly at the 32nd Street Magnet School/USC Mast. from Los Angeles, California. Again in 2014, he was part of the NAMM Show playing for “Joyo/Dr.J” effects pedals and UK’s “Hiwatt amps”, where he shared a jam session with Elliott Easton (Steely Dan, Blues Brothers, Yoko Ono, etc.). In 2015, Marcelo Roascio was the first argentine rock musician to play at the “Music China” fair in Shanghai (China), where he was invited by “Joyo Technology” (effect pedals) and “Kirlin Cable” to do five shows at their booths. 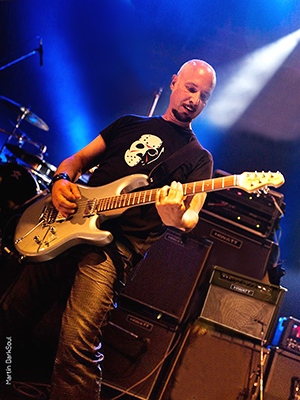 Being a musician himself, Marcelo Roascio did also several clinic-translations with artists like George Benson, Alphonso Johnson (Santana, Weather Report), Steve Lynch (Autograph), Heinz Affolter, Steve Morse (Deep Purple), Marty Friedman (Megadeth), Stu Hamm (Joe Satriani), John Patitucci (Chick Corea), Scott Wilkie & David Derge (Roland), John Maul (Roland), Nicko McBrain (Iron Maiden), Lee Oskar, Gregg Bissonette (D.L. Roth, Satriani, Vai), Steve McNally (Korg), Freddy DeMarco (Vox/Korg demonstrator), Michael Smith (Peavey), Will Smith/Dr. Epiphone (Epiphone), Brian Gabriel (Vox clinician), Tosin Abasi (Animals as Leaders), among others. During 1983, Roascio was one of the first argentine musicians who served as YAMAHA's local endorser, appearing in several magazine ads. In 1993 he begun to work as an endorser for CRATE amplifiers, doing clinics though the whole country. During 1996 he briefly was part of the musicians staff for IMSA/Promúsica, demonstrating SAMICK guitars and BOSS/ROLAND effects. In 1997, besides doing the CRATE clinics, he was named endorser for ARIA Pro II (guitars), DANELECTRO (effect pedals) and DiMARZIO (pickups). From '99 to 2000, after finishing his former contract, Roascio worked as a clinician for the local distributor of IBANEZ guitars, LANEY amps and THOMASTIK strings. In 2001 he participated in the LINE 6 products clinics with guitarist/clinician Will Rodriguez in Buenos Aires. From 2003 to 2006, he worked doing clinics with two argentine music companies -WENSTONE amplifiers and D.O.H. guitars- and also for QUEEN guitar strings. From 2007 ‘till 2014, Roascio was international endorser for FERNANDES guitars, appearing at their catalogue. Since 2009, he is endorsed by ERNIE BALL strings, MORLEY pedals, HIWATT amps, KIRLIN cables, JOYO pedals and ANTITODO straps, appearing in their ads and doing clinics all over Argentina. In 2015 he became international endorser for ERNIE BALL/MUSIC MAN and also STERLING by MUSIC/MAN guitars, appearing on their 2015 catalogue. Marcelo Roascio is a fruitful writer. In 1984 he contributed with his first music column in the “Rocker” magazine. From '87 to '92 and again during 1995, he wrote a regular guitar column in “El Musiquero” magazine. From '92 to '94 he was editor-in-chief of the “Musicos” magazine. From 1991 to 1999, he also wrote a guitar column in the monthly magazine “El Biombo”. During 1997 he colaborated with “El Rockero”, a magazine that came out with a CD collection in the magazine “Noticias”. From April 1996 to December of 2001, Roascio was the editor in chief of “Music Shop”, the first musicians instrument's magazine in Argentina. In April of 2002 he begun to write the first technical consultancy in a spanish spoken guitar related web site called "El Rincón del Guitarrista" (www.guitarraonline.com.ar), doing also equipment tests and several related articles. In 2004 he started to write a monthly column in "El Guitarrista" magazine, besides writing a monthly technique column in the spanish magazine “Guitarra Actual” (Spain). From 2006 to 2009, he became the Editor-in-Chief of the “Guitarristas.ar” magazine from Argentina. Starting 2010 to this date, he’s Editor-in-Chief of “Todo Guitarra y Bajo” magazine. In 1988, Marcelo Roascio decided to bring to Argentina a new way of teaching, wich he saw during his visit to USA: books with audio-cassettes. His first book -“50 Fraseos”- started a new way of learning in the electric guitar field. The following years he published “50 Fraseos Vol. II” and “50 + 50 Fraseos Vol. III”. His next books were “Blues: 10 solos for electric guitar”, “Blues: 10 rhythms for electric guitar” and “Blues: 10 rhythms for bass guitar”. After putting out similar books for rock & roll, he starred in 1993 a video-clinic called “Desarrollo de Melodías”, wich was directed by Soda Stereo’s videos director Alfredo Lois, and was one of the bestsellers of it's type. In 1994 he came out with two books: “Fraseos y Solos de Blues” and “Guitarra eléctrica desde cero”. During 1995, Roascio wrote “Escalas” and in 1996 “Heavy, Hard & Trash”, two books with rhythms and solos for electric guitar. In 1998 he wrote the second part of his “Guitarra eléctrica desde cero”. In 2003 he published the book "Rock Instrumental… with the songs from RCM Espías". In addition, he wrote two booklets for the Wensound Electronics Co. -"Guitarra de principio a fin" and "Bajo de principio a fin"- wich accompany the WENSTONE amp line for beginners. In 2005, Roascio wrote “Todo Guitarra - All Guitar”, his book number fifteen. In 2007 he published “Sólo Pentatónicas”, and in 2011 he published “Escalas Modales para Guitarra Rock”, Roascio’s last book to this date. All the books now come with an audio-CD instead of the original cassettes, and are distributed through the whole country, Chile and Uruguay by Melos Ediciones Musicales (www.melos.com.ar).